Salt - How Much Is Too Much? Eating too much salt can cause high blood pressure which increases the risk of developing coronary heart disease. It’s important that you don’t eat more than the recommended amount of salt each day. Adults should eat less than 6g of salt a day - that's about one teaspoon. Checking the nutritional information on food labels will help you to choose healthier options. Being aware of how much salt you eat will help you to stay healthy, and it's not just about the salt you put on your food after it's cooked – there’s plenty of hidden salt to think about too. Some staple foods like bread and breakfast cereals have added salt, and it can also be found in sweet foods like cakes and biscuits. To reduce your salt intake, avoid foods with high salt content. Use food labels to choose lower salt options. 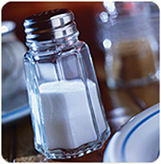 Health experts recommend that adults should consume less than 6g of salt a day. To give you a clearer idea, one level teaspoon contains 6g of salt. If you think you may be consuming too much salt, you are not alone. Currently, the average daily intake of salt by adults in the UK is far too high – with many people consuming over 9g of salt each day. Regularly checking the nutrition information on food labels can help you to choose healthier options for your diet. Salt often appears as sodium on food labels (6g of salt is equivalent to 2.5g of sodium). 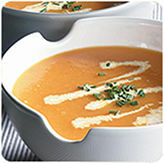 For pre-prepared foods, look at the ‘amount per serving’. Watch out for cooking sauces (especially soy sauce) as some of these are very high in salt.